This post is filed under Asian Style Sensations, Cabbage, Frozen, Oven, Pork, Shrimp. “…where you see all the orientals eat.” Orientals is a racist term referring to anyone of Asian descent. 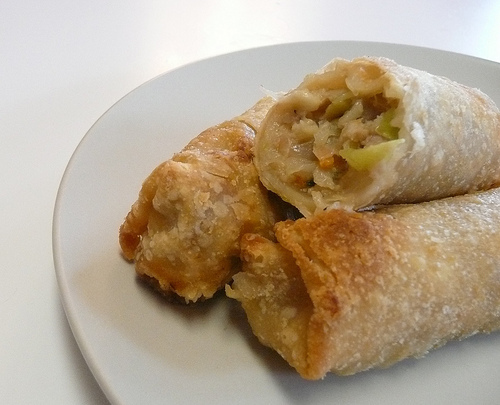 Egg rolls are associated specifically with Chinese food. Judging by your buying of egg rolls from a chinese restaurant, I’m assuming you haven’t been to a chinese restaurant that hasn’t been americanized for well, american tastes. Head to the chinatown where you see all the orientals eat, and that is probably your best bet for real (no guarantees on good) chinese food. “Whether this indicates that these are quality egg rolls or that I have never eaten truly delicious Chinese takeout is unknown.” – Hahahaha. Chung’s spring rolls (not egg rolls) are quite good. To eliminate greasiness, lay the spring rolls on a wire rack over a cookie sheet, the oil will drip on the pan while baking. The spring rolls will be crispy but not too greasy .Also, empty the dipping sauce into a small bowl and microwave it for 15 seconds so the sauce will caramelize a bit. 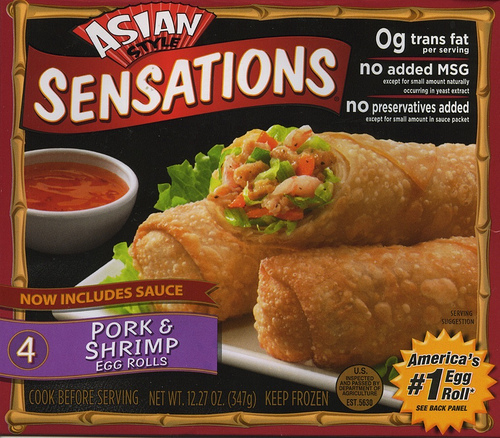 Holy crap guys.. these are FROZEN egg rolls out of the supermarket! Of course they aren’t going to hold up to the quality of authentic Asian Cooking. And you don’t call Asian people Orientals… ha ha… RUGS are Oriental.. not people. BUT! If you don’t want to spend all day making egg rolls.. these are a good quick version. NO they aren’t colorful.. but your stomach isn’t an interior decorator in its secret life either. They taste very good and isn’t that really the idea? The egg rolls on the box have been deep fried. Egg rolls from Chinese resturants (at least where I live) are typically fried. When I worked as a banquet chef, we deep fried egg rolls and spring rolls. They came out about the same color no matter if we hand rolled them or bought them frozen. The point I am trying to make here is that preparation matters to presentation. MOST of the frozen egg rolls I have purchased from places like Sam’s Club (and judging by the photo of your pantry, you spend a fair bit of time at Sam’s or WalMart purchasing grocery items) have directions on the back for baking or deep frying. Did this box only suggest baking?